Paper Crafts by Candace: Emily's "Back to the 80's" Birthday Blog Hop! I love My Little Pony! Super cute card! That is PERFECT! What an adorable card!! That card is adorable. I remember having My Little Pony, I loved the 80's, still love the music too! I love my little pony!! Too cute!! Oh My Little Pony! How cute is that? I Love, Love, Love getting handmade stuff. I told my daughter I only want handmade things for Christmas! To me something handmade is the best! My Little Pony is so 80s! Love the card! You didn't cheat! (that bad) ;0) this card is adorable!!! I love it! I adore your handmade gifts!!!!! Thanks for the chance to win. very cute card!!!! I love my little pony! Too cute!! Congrats also on "Jaded Blossom". You and Michelle make a great team!! Thanks for sharing and the chance to win! Great card, I forgot about "My Little Pony". I just beacame a follower and looking forward to your next blog hope. Like OMG...this is an awesome hop idea...love love love you project!!! Cute card! My 5 yr old just loves My Little Pony! My Little Pony was one of my faves! Cute card! What a fun card! I love the colors! I'm a new follower! Cute card. My Little Pony is a classic. That is why they are popular with the little girls now. When my daughter was younger she just had to have all the different ponies. So cute! Gotta love the pony...this makes me giggle-- I still find it random that the MLP smelled like various things! So crazy! Some little princess is going to love that! That is a super cute card! I'd have never guessed it was a sticker! Cute ideas! thanks for the chance to win. My first "hop". gotta love those pretty little ponies ... they were fun. 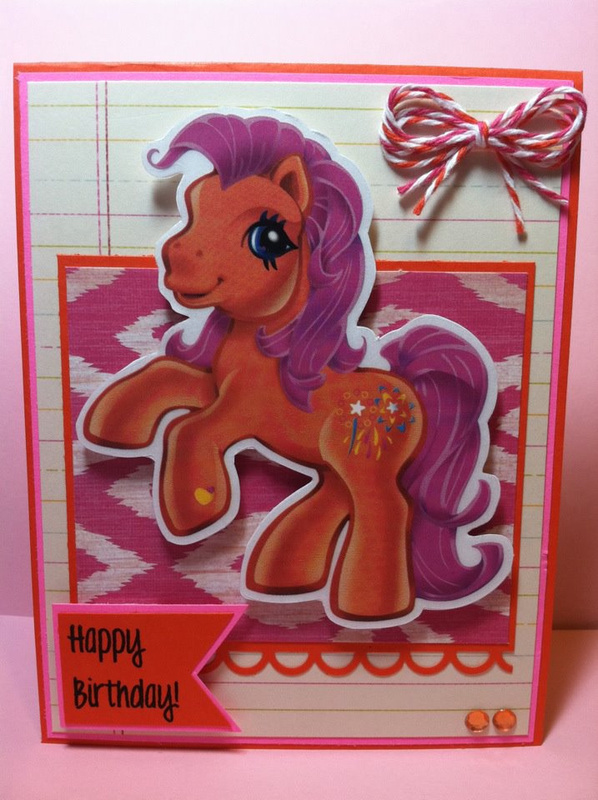 I loved My Little Pony's too :) Very cute card and I liked you on Facebook! Love my little pony! I am a follower! I love your My Little Pony Birthday card!! Hoping that Cricut comes up with a cartridge for it soon!! OMG!! this is sooo cute candace!!! I love this card. My Little Pony def takes me back. Love the twine. Great idea! I love My Little Pony, and my youngest daughter does, too. She would love that! Thanks for sharing! Nothing "cheating" about this adorable little card! If anything, you had to work harder to find a pony! Your card is just cute as can be. My boys were born in the 80's and I remember thinking if I only had a little girl, we could get into those cute little pony toys. I'm happy to see that they have come back around now that I have a granddaughter...and she loves them! My granddaughter would love this card. She loves my little pony, just like her mom use too. My little pony sure does bring back memories! Nice card! Thanks for sharing. I'm just old enough that I wasn't a fan of My Little Pony in the 80's. I LOVED My Little POny back in the day...whats great is my daughter loves them now too! (Cabbage patch kids, and care bears too! )Thanks for the chance to win some handmade goodies...so fun! Oh my gosh I dont know how I didnt see this! I love it!!!! I'm finally getting the chance to hop along. This is just so cute...I LOVED My Little Ponies! I'm so happy to be a part of this hop with you!